New – 2015 Dodge Challenger SRT Hellcat – 707 HP! Yes, really! Forget what you heard; Detroit isn’t dead just yet. 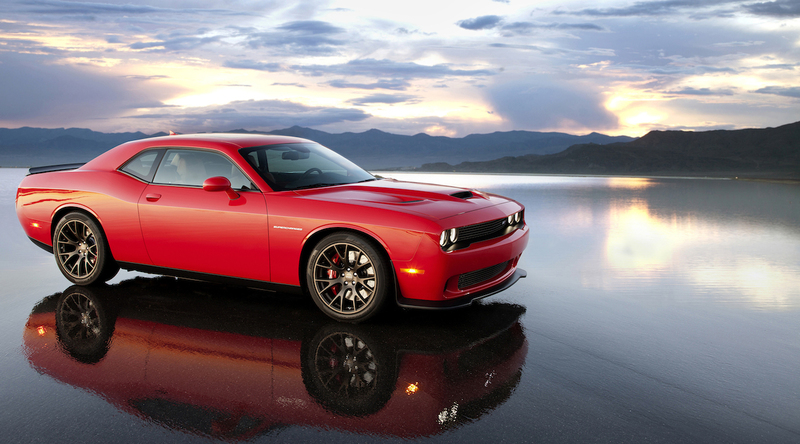 Dodge, as part of the Chrysler group has had a rough ride through the global recession recently. But forget all that because, to celebrate the company’s 100th anniversary year, it’s produced the seven hundred and seven horsepower Hellcat. Trying to write an opening paragraph without turning to expletives is pretty difficult with the Hellcat. I mean, come on, the name alone conjures up images of US Military hardware or a record label associated with loud punk rock. Whatever your interpretation, it’s not a subtle title. Perhaps they should have just named it the Challenger EPIC MOFO OMG instead. The heart of the Hellcat is a 6.2 litre V8 supercharged HEMI engine. 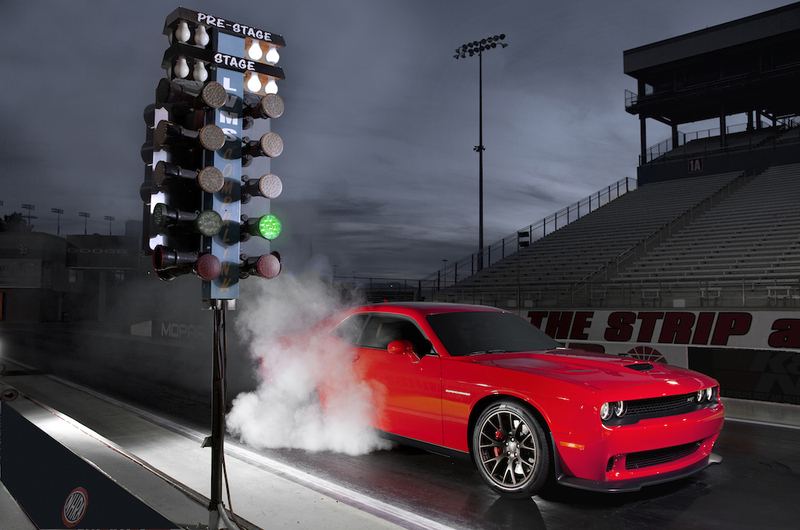 With that headline 707 bhp it’s not only the most powerful Dodge V8 ever made – so much so that all the engine testing rigs had to be upgraded – but also the first factory supercharged HEMI unit, and the production muscle car with the most stock power. There are so many superlatives and accolades to throw at this car; it’s as ridiculous as the 650 lb-ft of torque it produces. Expect to shred lots of 20″ rear tyres with that much twist. 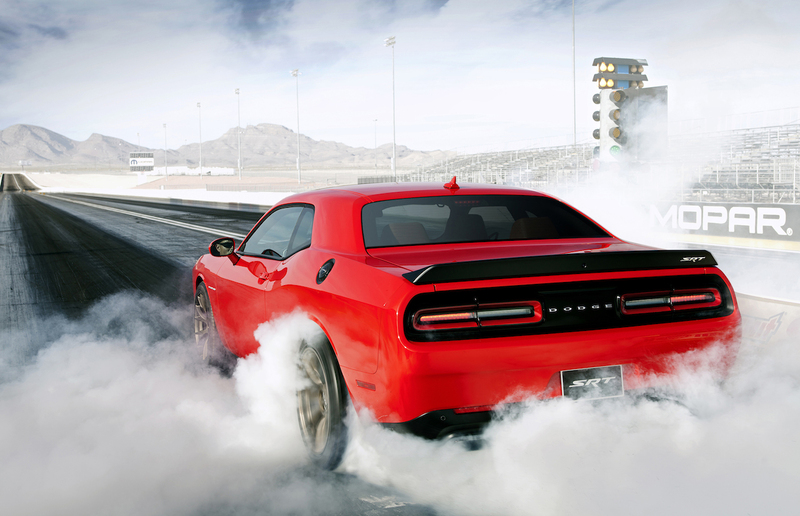 Don’t mistake the Hellcat for Dodge simply shoehorning a huge motor into the Challenger’s engine bay though. The upgrades to it have gone into immense detail; even down to the driver’s side parking light being deleted to fit an Air Catcher cold air intake. In addition, the rest of the exterior has also been modelled in a wind tunnel, spending 33% more time there than the regular Challenger, to ensure it’s as aerodynamically efficient as possible. The front splitter and rear wing are obvious products of that, but work has also been done to cool that massive motor and the attached twin-screw supercharger. A special straight-through exhaust is fitted to maximise power and noise. Stopping is courtesy of the biggest brake setup ever fitted to a production Dodge; 390mm two-piece front discs with 6-pot Brembo calipers at the front, with 360mm discs and 4-pot calipers at the rear. Designed to resist fade during hard track use, that is a serious uncompromising braking system. 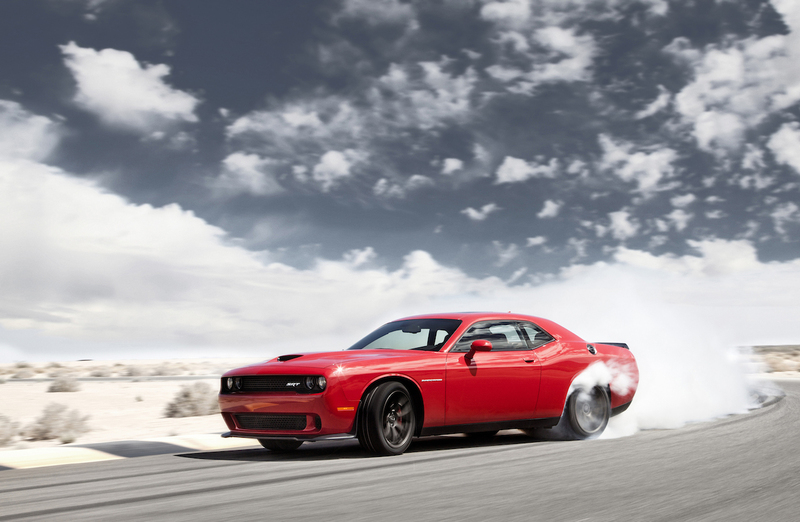 Suspension changes for the Hellcat include three-stage Bilstein dampers with the choice of selectable track, sport, or normal modes, along with other upgrades. Traction control offers multi-stage options, and is supported by an uprated Limited Slip Differential to give the rear axle a fighting chance of controlling things. Transmission choices comprise a six speed manual from the SRT Viper, or a ZF TorqueFlite eight-speed automatic; the latter featuring enhanced programming to ensure the shifts come as quickly as possible. 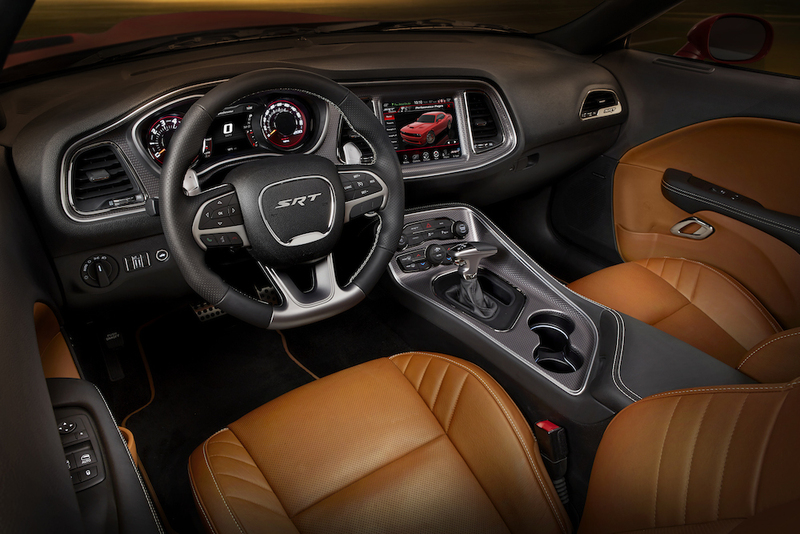 As part of the revisions for the 2015 Challenger range, the Hellcat gets a revised interior with styling hints taken from the iconic 1971 Challenger. That means a driver orientated centre console, ball-shaped gear shift knob for the manual transmission along with a host of other retro touches. The integrated touchscreen dashboard lets the driver swap between driving modes, record 0-60 mph runs and call up a range of dials and readouts such as boost pressure or oil temperature. Like a Bugatti Veyron, the Hellcat comes with two ignition keys; a black one which allows for up to 500 hp – described as for everyday use – and a special red key that unlocks the full 707 hp. US muscle cars often get derided by European writers for being too clumsy or featuring antiquated engineering. However, the Hellcat packs a huge bundle of modern technology, an optimised chassis and thumping power into its retro style body. That should be enough to scare commentators this side of the Atlantic. Dodge hasn’t released any prices for the Hellcat, but expect it to be affordable compared to all those other cars with 700 + bhp such as the Lamborghini Aventador or Pagani Huayra. Production at the Brampton plant in Ontario, Canada is imminent with deliveries in the third quarter of 2014. Show up at the strip, destroy all the competition, drive home in leather-lined comfort. F*ck Yeah! ‘Murica! Happy early 4th of July.